These are words that for so long seemed to be such a distant dream, that it now feels quite unbelievable to actually be writing them. It’s been an absolute privilege and pleasure living Lettie’s Ride the last few years; I’ve met 1000s of amazing people en route and been completely humbled every day by the goodness and generous hospitality of absolute strangers, with whom I was often unable to share a single word; but undoubtedly the best days of the ride have been those I’ve shared with friends… those memories among a million others will always stand out for me. I feel like the luckiest man alive today, to be able to share the final stretch to the Rugby World Cup with such an incredible group of friends, old and new! 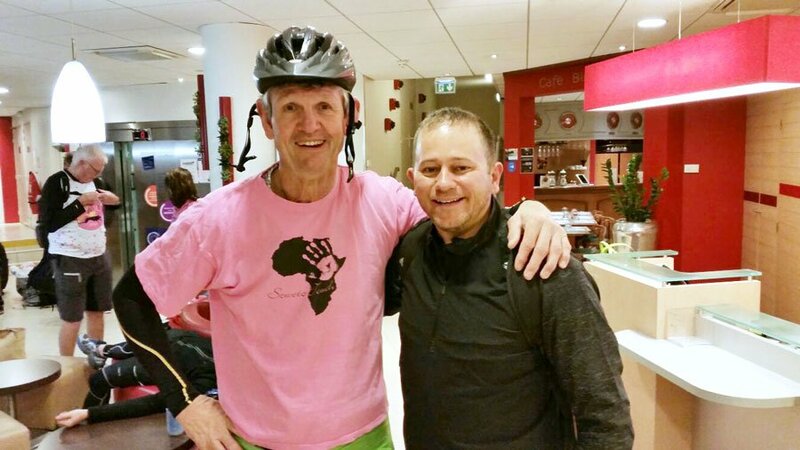 Morné du Plessis with Laureus Ambassador Dan Nicholl, joining Ron Rutland for the final stretch of the ride. Thank you to every single one of you for not only the monumental effort in getting to Paris, and in many cases the incredible amount of work done to prepare for the cycling, but also for believing in the Fat Kid and Lettie’s Ride, and your support in every way imaginable… it’s humbling beyond words. 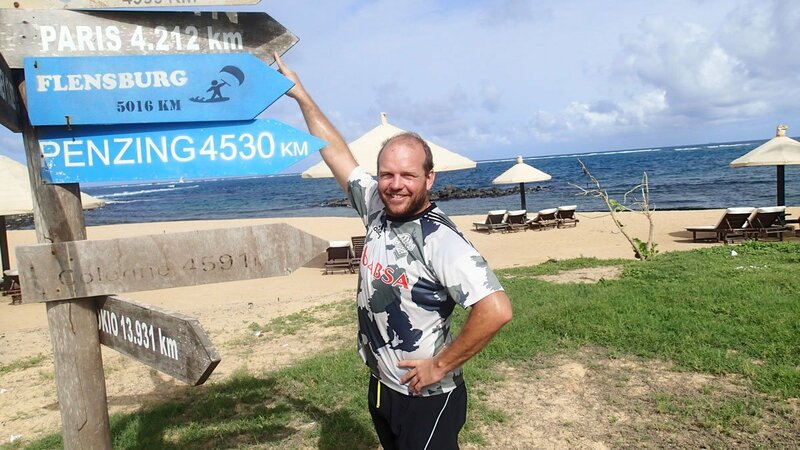 The highs and lows of the last 807 days spent cycling and hacking 40,000km across 75 countries since departing Cape Town stadium have quite simply been the adventure of a lifetime. I dreamed this dream for so many years, devoured every book, blog and magazine article on the subject and spoke to every adventurer I could find. I thought I had a pretty clear picture of what lay ahead that bright winter’s morning; but how wrong I was… absolutely nothing can prepare you for what happens when you allow passion and purpose (and focus) to come together as you completely and utterly throw yourself at the mercy of your dreams (and the African continent)! 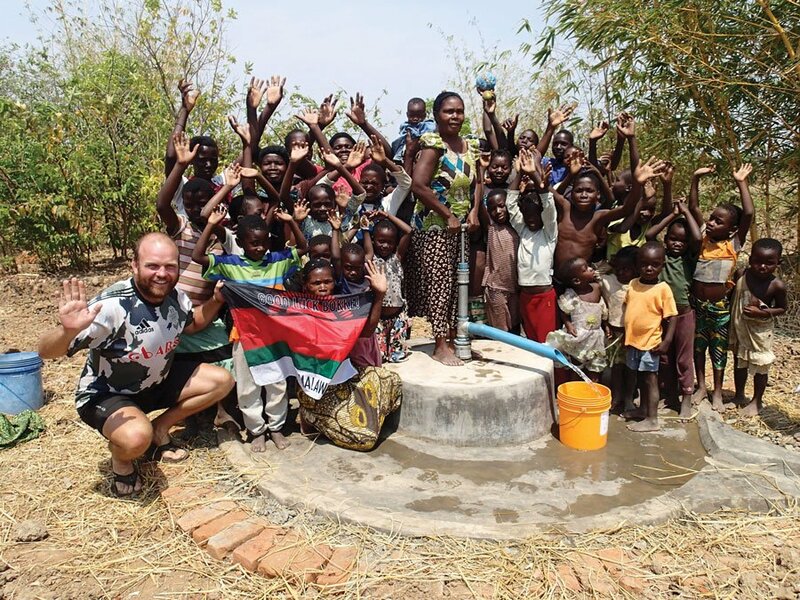 Ron passing through a local community in Malawi. For the last 27 months to be more than just a passionate Springbok rugby supporter avoiding an expensive flight to the World Cup, I’m delighted that there’s a more meaningful legacy – in the form of supporting the incredible work of the Laureus Sport For Good Foundation, that uses the power of sport to uplift people. 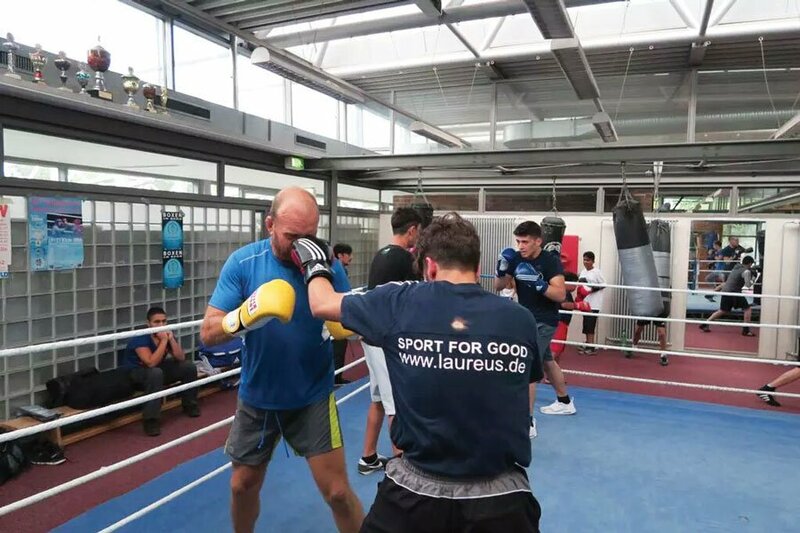 Having visited various Laureus projects and witnessed first-hand the most inspiring stories imaginable, I’m proud indeed to facilitate in some small way their (literally) life changing efforts. I look forward to doing so in the future too. I’m grateful to the Laureus Ambassadors and representatives, Morné, Hugo, Dan and Brett for being here on our Paris to Brighton fun(d)raiser, and for all their behind-the-scenes help in making this event happen. Quite fankly, without them, we wouldn’t be here today. I encourage you all to find time over the course of the week to share a drink with them, and get to know them and their organisation a little better. And of course, please help spread the word about Laureus. Push, prod and encourage your friends, families, colleagues, and companies to support our fundraising efforts this week, during the RWC and beyond. On the subject of legacy, this finale to Lettie’s Ride isn’t quite how I imagined it would be. I always pictured our peloton being led from the front by our great ‘china,’ Nix ‘Lettie’ Haynes, an amazing mother, wife, daughter and sister; quite simply one of the most remarkable people one could ever hope to meet. Very sadly, this wasn’t meant to be. But Nix left behind her own incredible legacy which has touched so many, and will do so going forward. This will be in the form of the newly established Lettie Love Fund. I’m also thrilled that Nix’s husband Charles, her in-laws Bob and Marian, and so many of her dear friends are here with us this week… a big thank you to all. Please get to know them and allow Zoog to tell you more about the work of the LLF, their needs and future plans. I’m a great believer in serendipity and one never knows where a conversation may lead! 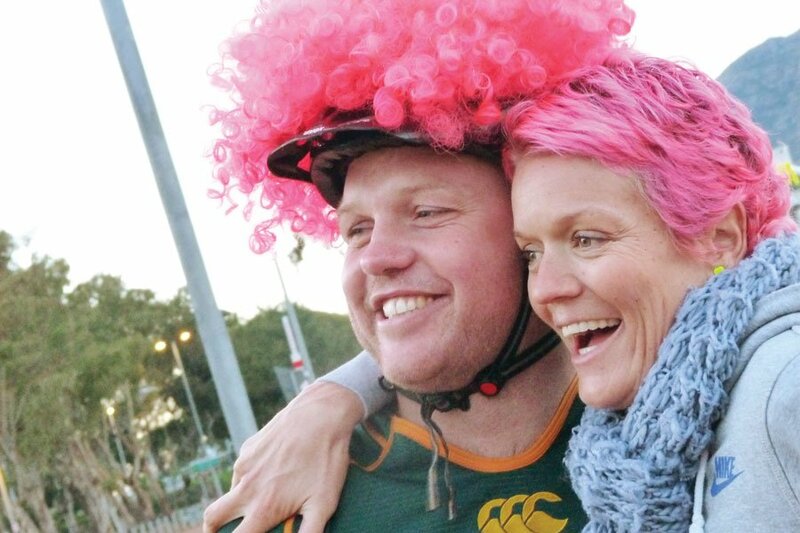 Lettie Heyns seeing “The Fat Kid On A Bike” off at the start of his journey in Cape Town.